Every investor, be it in any stock market across the world, would have come across many stocks, which trade on sky high price to earning (PE) ratios. These PE ratios sometimes cross all reasonable levels of valuation logic; sometimes even crossing levels of 100! I have been repeatedly asked by many investors whether they should invest in such high PE stocks and why I always stay away from such companies. Many investors perceive high PE companies as the ones with assured future growth and very good management. Other investors perceive low PE stocks as the ones with assured problems. A recent incident, when I received an offer from a broker to buy stocks of an unlisted insurance company of a very reputed financial services group, at a very high PE ratio, made me think about different aspects of investing in high PE stocks. The argument inevitably led to a comparative analysis of investing in high PE and low PE stocks. The current article is an attempt to put in perspective the odds of success and the hidden risks that investors face while investing in high PE stocks. 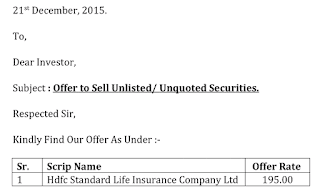 Recently, I got an offer from a broker to buy stocks of HDFC Standard Life Insurance Company Limited at ₹195. The company is not listed on stock exchanges, therefore, there are limited opportunities to buy its stocks. As I am always willing to explore stocks, therefore, I thought about doing a preliminary analysis of this opportunity. HDFC Standard Life Insurance Company Limited provides its financials, annual reports, investor’s presentations on its website. Therefore, it was not difficult to do a brief assessment. I found that the current earnings per share of HDFC Standard Life Insurance Company is ₹3.93, which meant that the current price amounted to a price to earnings ratio (PE ratio) of almost 50 (49.62 to be precise). I am a value investor who likes to buy stocks cheap; in fact, very cheap. The cheaper, the better. Usually less than PE ratio of 10. The offer of shares of HDFC Standard Life Insurance Company at such a high level (PE ratio of 50) made me think about the proposition, which should be offered to investors to make them buy stocks at such valuation levels. Underpenetrated insurance market in India leading to huge market opportunity. HDFC group companies (HDFC Limited, HDFC Bank Limited) have been accorded good valuations by markets in terms of both price to equity ratio (PE ratio) and price to book value ratio (PB ratio). This gives the confidence that if HDFC Standard Life Insurance Company Limited repeats the performance of its group companies, then market might be willing to assign the same level of valuation parameters to it as well. and many more reasons, including that HDFC Standard Life Insurance Company Limited would come with an IPO later where stocks would be sold at even higher price. We leave such other reasons for discussion for some other day. I found that this proposition is no different than any other listed stock, which is currently trading at sky high valuations of PE ratio of >50x. In all these cases, an investor is presented with an established brand, which is mostly market leader having a huge untapped market potential for continued future growth. There are many examples of such stocks like: Page Industries Limited, Eicher Motors Limited, Just Dial Limited (which until recently, used to trade at PE ratio of >75). Therefore, the current article is equally relevant for stocks both in public and private markets, which are trading at high valuations. I imagined that the investor had already bought HDFC Standard Life Insurance Company Limited at the offer price of ₹195 currently in year 2016. I imagined that time has shifted by 10 years (year 2026) and the investor is still holding the shares of HDFC Standard Life Insurance Company Limited that she bought in 2016 at ₹195. I imagined that over last 10 years (2016-2026) all the above assumptions about future growth of insurance sector and resultant growth of HDFC Standard Life Insurance Company Limited, have come true. 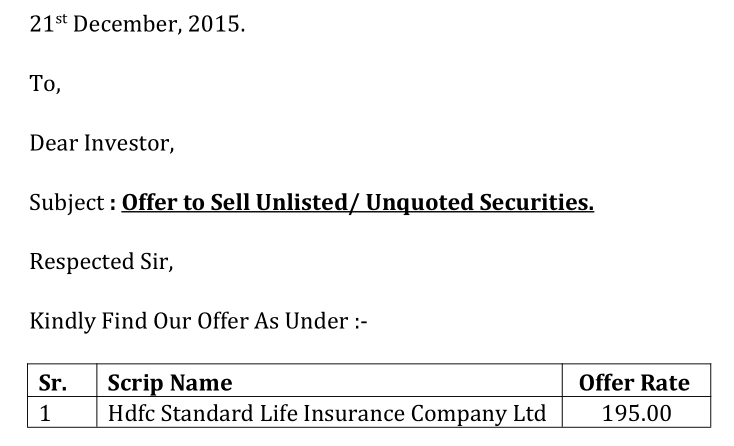 I imagined that HDFC Standard Life Insurance Company Limited is now listed on stock exchanges, in year 2026. I also imagined that HDFC Standard Life Insurance Company Limited is being valued at similar levels at which other established HDFC group companies like HDFC Limited and HDFC Bank Limited, are trading, after showing decades of sustained good business performance. With all these imaginations in my mind, I thought about the kind of returns the investor would have made as a long term investor in HDFC Standard Life Insurance Company Limited. HDFC Standard Life Insurance Company Limited grows its earnings by an excellent rate (CAGR) of 25%. It is seen that growth rates in excess of 25% are unsustainable over long periods of time and growth, even for established brands, inevitably moderates to such reasonable levels of 20-25%. Take the case of Hindustan Unilever Limited, which has grown by 11% over last 10 years. HDFC Limited and HDFC Bank Limited are currently trading at consolidated PE ratios of 17.75 and 22.74 respectively (data from screener at February 27, 2016). I assumed that HDFC Standard Life Insurance Company Limited would trade at a PE ratio of 23 after 10 years of consistent growth. I assumed that HDFC Standard Life Insurance Company Limited would be paying dividend to reward its shareholders for association. Its dividend yield is expected to be about 1-2%, in line with other large cap stocks. HDFC Limited and HDFC Bank Limited have current dividend yields of 1.43% and 0.83% respectively. An annual return of 17% over 10 years, is a respectable rate of return for any investor. I would be very happy to earn a return of 17%, if it’s reasonably certain, over 10 years. However, in life, especially in business and equity markets, environment changes very frequently. Well thought out assumptions fail to materialize and the growth shown in business models remains on excel only. Current market leader, Life Insurance Corporation of India Limited (LIC), might reduce prices of products, which are currently the costliest in the market and it prices them at par or below private competitors. (Nothing beats the assurance of sovereign guarantee for an insurance company as a surety against payment default when claim needs to be paid. I would have chosen LIC over the any other company, if its premium for term life insurance plan would have been similar to other players). this one step by LIC has the potential of deflating business models of many non-serious players in life insurance sector and severely denting the growth rates of others. Government’s ongoing drive to liberalize insurance sector in order to allow infusion of capital by foreign players, would make even relatively smaller Indian players who could tie up with strong foreign partners, as formidable competitors to HDFC Standard Life Insurance Company Limited. It would make the achievement of sustained growth by HDFC Standard Life Insurance Company Limited, difficult. HDFC Standard Life Insurance Company Limited might suffer from human errors in leadership, which may delay its growth plans by a few years. Judicial activism/public interest litigations/NGOs, might change the entire business environment altogether, which might make even doing business, leave apart growth, difficult and put the entire industry behind by a few years. Instances of coal block de-allocation, cancelling of 2G spectrum are pertinent. Such events are becoming more and more frequent, which even though highly beneficial for the industry in the long run, might push the development back a few year when seen in perspective of investor’s investment horizon. Sometimes, the challenges come from entirely unexpected events. Investors in Shale Gas industry would never have seen the oil price slide coming, which has made many of the companies, bankrupt. Above instances try to highlight the fact that there can be many factors, which may be completely out of control of HDFC Standard Life Insurance Company Limited that might impact its earnings growth rate over next 10 years and consequently, it might grow at a rate lower than 25%. There can be many more reasons to believe that the market situations might change and HDFC Standard Life Insurance Company Limited might not be able to command a PE ratio of 23 after 10 years. It is evident that the business and market valuation assumptions might not sustain as discussed above in the calculation of expected total return of 17% per annum, by holding shares of HDFC Standard Life Insurance Company Limited over 10 years. Therefore, it becomes pertinent that we should do a sensitivity analysis of the total return that an investor would earn over varying situations of earnings growth rate that HDFC Standard Life Insurance Company Limited might achieve over next 10 years and the valuation level that market might be willing to assign its shares after 10 years. The table reflects the precarious situation, which an investor puts herself into, by buying stocks at a high price of 50 times the earnings (PE ratio) in the first place. If the annual sustained business/earnings growth rate achieved by HDFC Standard Life Insurance Company Limited over next 10 years is less than 15% (which in itself if a very good growth rate to achieve), then even if the market values it at a PE ratio of 25, the return of an investor would be 9%. Moreover, if the market decides to value HDFC Standard Life Insurance Company Limited at a more reasonable PE ratio of 15 (assuming PEG ratio of 1), then the return to the investor would be mere 3%, which is less than the returns provided by a savings account (offers 4%, tax-free up to ₹10,000 per year and after that 2.8% assuming highest tax rate of 30%). And importantly, despite a healthy profitable growth rate of 10%, the investment might become loss making for the investor if market does not value HDFC Standard Life Insurance Company Limited at a PE ratio of about 20. This scenario analysis clearly depicts that by initially purchasing the stock at a high PE ratio of 50, the investor has put many odds against herself. For her to make a respectable return and beat the return offered by fixed income instruments in India, her selected company must grow its earnings at a rate higher than 20% per annum and market must value this company at a PE multiple of more than 20. Otherwise, she might be better off investing in a fixed instrument and have peace of mind while sleeping. Such a situation reminds me of a runner, who has to keep running at the treadmill at a high speed of 20km/hour for 10 years and the selection committee (market) must recognize her efforts (assigning valuation levels), otherwise the it might not be a very happy ending. This becomes a very stressful situation for the runner and increases the chances of injury. The margin of error here is very low. Read 3 Principles to Decide the Investable PE Ratio of a Stock for Value InvestorsLet’s assume the investor finds a company, which is hitherto unknown and growing at a good pace with sustained profitability, is conservatively financed and is available at a cheap valuation (assume PE ratio of 10). An investor would notice that if she does not over pay (i.e. buys at a PE ratio of 10 in this case), then even if the company achieves an earnings growth rate of 10% per annum over next 10 years and the market assigns the company a PE ratio of 10, she would make a total return of 11%, which is equal to returns offered by the most attractively priced creditable fixed return instruments in India. Any scenario of a higher earnings growth rate over next 10 years and any valuation level higher than PE ratio of 10, would bring positive surprises for the investor. Earnings growth rate of 20% and PE ratio of 20, which was essential to beat the fixed income instruments earlier (when initial purchase price was at PE ratio of 50), would now give the investor an annual total return of 30%!! From the above analysis, an investor would appreciate that she can turn the odds of the stock market in her favour, if she decides never to overpay for her stocks. She should avoid buying stocks at high PE ratio, however attractive the story may seem. Instead, she should spend time in finding out companies that are growing at a decent pace with sustained profitability, are conservatively financed and are yet to be recognized by the markets. The hard work spent in finding out such hidden opportunities can tilt the odds in her favour. She can remain assured that even the modest sustained growth in the earnings and any recognition of her stock pick by established brokerage houses/institutional investors, would bring very pleasant rewards to her portfolio. I always advise investors to focus more on the initial stock selection by finding good companies at an attractive price. It’s like a treasure hunt. However, once the investor has invested in such a company, then she can sleep peacefully over many future years. She can keep adding to her such stocks at every decline with the assurance that the game of the markets is now tilted in her favour. Never overpay for a stock. “Buy good stocks cheap and get peaceful sleep”. An investor might think that if a stock is fundamentally sound, then the market would have already recognized it and it would no longer be available at low PE ratio. The investor would not be wrong with this assumption. However, over time markets have proven that good quality stocks especially, the ones with low market capitalization, can remain hidden from institutional radar for prolonged periods of time. No wonder that entrepreneurial investors have been able to find attractive investment opportunities in the markets at cheap valuations. On the contrary, the investor might also think that any stock would be available at a low PE ratio only when it has certain problems and it might deserve low PE ratio. The investor is not entirely wrong in this assumption also as low PE segment is the area which contains almost entire junkyard of stock markets. However, it is this same low PE segment, where hidden opportunities exist, which have the potential of providing good returns to investors. I believe that the common perception of high PE stocks being safe and low PE stocks being risky, is the very reason that entrepreneurial investors are able to find good investment opportunities in different market situations. Moreover, an investor does not need to find a lot of such opportunities of fundamentally sound companies available at attractive prices. Experiences of notable investors have shown that a handful of such companies over the lifetime of the investor, are sufficient to create significant wealth for her. I believe that if an investor is able to one such stock every one or two years, then it is more than sufficient for getting good returns from stock markets. To conclude, I believe that an investor should focus on finding fundamentally sound companies available at low PE ratio and avoid buying companies with high PE ratio. If an investor is able to follow this approach and find a handful of stocks over her lifetime, then she could expect to have the odds of the market turned in her favour. In this way she can expect to generate significant wealth from stock markets without losing her peaceful sleep. I would like to know about your stock picking approach and your views about investment in low PE and high PE stocks. It would be a great learning experience, if you could share your experience of investing in low PE or high PE stocks, with the author and the readers of the website. You may share your inputs in the comments section below.